You know me - I love to collect data. 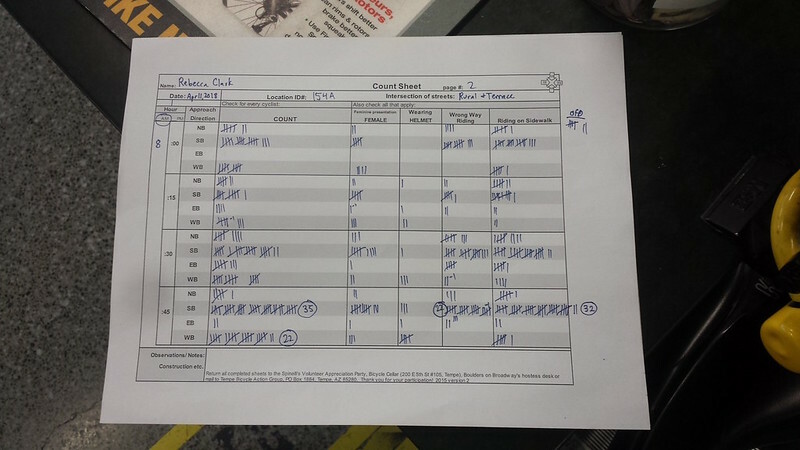 So of course I participated in this year's rendition of the annual Tempe Bike Count, run by my beloved Tempe Bicycle Action Group. After perusing the possible count locations, I wound up choosing to count the intersection of Rural Road and Terrace because I knew it would be interesting. It did not disappoint. There's currently construction happening on 3 out of the 4 corners. Two of the corners are getting converted into massive student housing units ("luxury"? Dunno.). The fourth corner is a light rail station. To the east of this whole area, there's a ton of student apartments, along University (just to the northeast of this image), 8th street, and more. So a lot of students filter on to campus at this crossing. Hard to get on or off this path when there are hard curbs in the way. In the upper photo, you can also see where the old paint-marks for the bicycle left turn lane have been scrubbed off the road surface, and where the old path used to be. 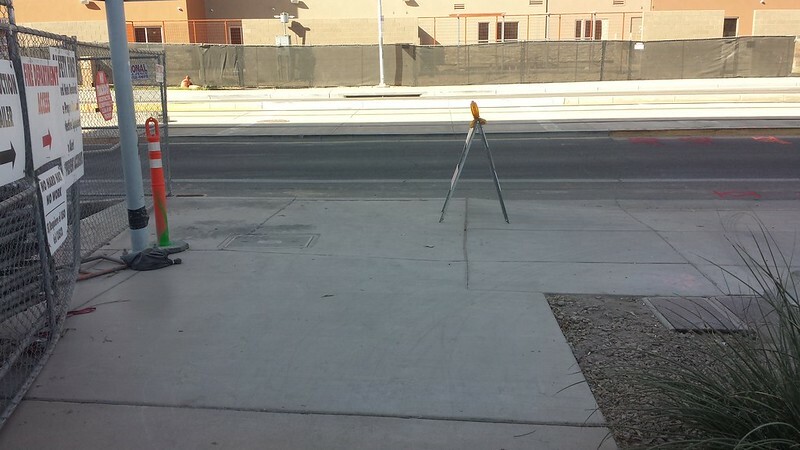 There are currently zero markings or signs pointing to the new path as a bike path. You'll also notice that zero bicyclists ride on the road along Rural. When I use this intersection, I engage in exactly the same behavior as everyone else. Overall, it's kind of amazing to see how many people access this area on foot or by bicycle. I mean, I use it a lot because it's more pleasant than the intersection just to the north, at University and Rural, and there are a handful of businesses in the area between University and 8th Street that I like to visit. 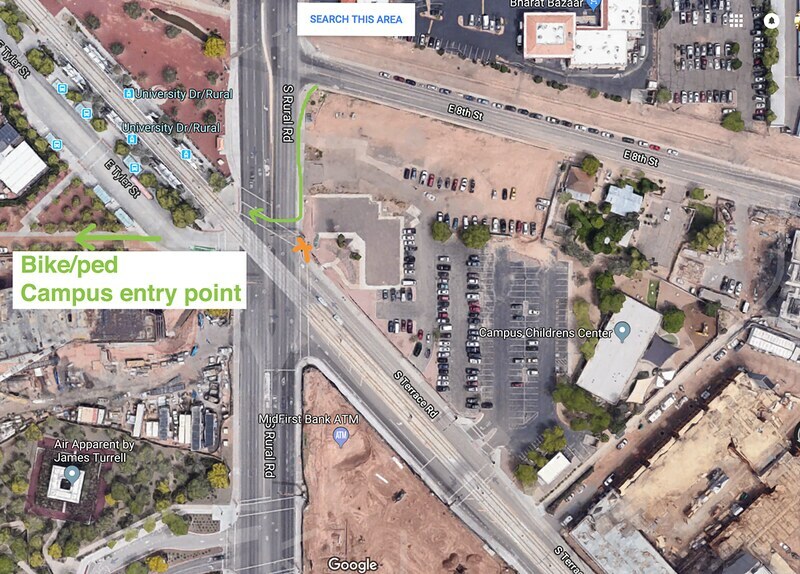 That said, it's not nearly as pleasant to transit there as, say, Mill Ave. And this is only speaking in relative terms, because Mill Ave isn't all that great, either. From a political standpoint, it is currently extremely difficult to make any changes to Rural to get bicycles off the sidewalks, because Rural is a major, fast-moving north-south corridor for motor vehicles. Probably the only way it would ever change would be if motor vehicle ownership/maintenance costs skyrocketed, such that more people grudgingly switch over to mass transit and carpooling. 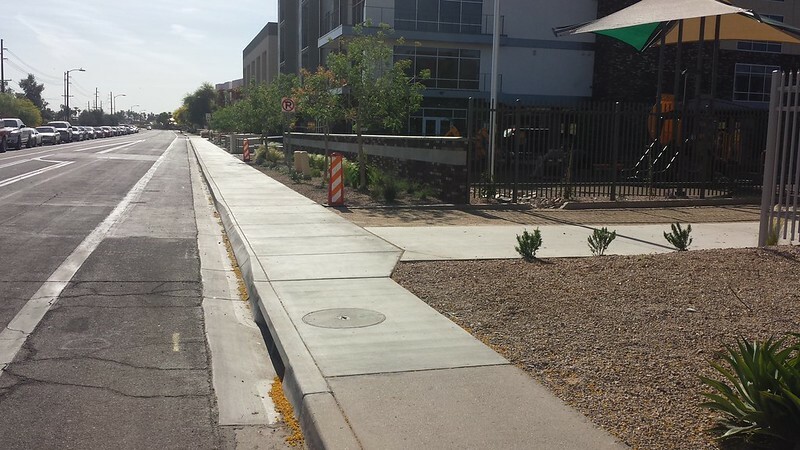 It would be a beautiful corridor for mass transit, all told, but Scottsdale residents will never let that happen. And I bet it's going to undergo some dramatic changes once construction wraps up for the additional apartment buildings and even more students pile in to the new units. I don't know if the new units will be mixed use for housing/commercial or not, but even if they're only housing, the increased density will probably boost business to the strip malls at the intersection of University and Rural. All told, it's a great place for increased density. This entry was originally posted at https://rebeccmeister.dreamwidth.org/1220138.html. Please comment there using OpenID.